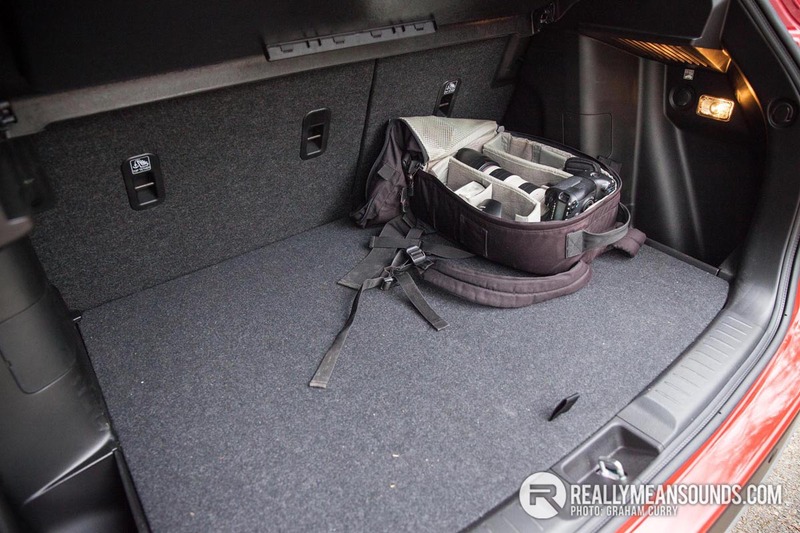 The all-new Vitara has smaller dimensions to meet contemporary needs. It incorporates Suzuki’s cutting-edge ALLGRIP four wheel drive system and advanced safety and connectivity equipment, it also enables owners to express themselves through various personalising options and the Vitara faces healthy competition from the likes of the Renault Captur, pushing this segment further than ever for spec and ability. The Vitara range offers a vast amount of options inside and out which makes up for a lack of engine choices, however this lack is a good thing I feel as it means that what’s on offer is tried, tested and proven to be a success which then keeps the reliability to a maximum. There are two engines available on the non “S” models, both 1600cc one a petrol and one a diesel, the petrol produces 118bhp with 115lb/ft whilst the diesel gives the same bhp with a staggering 236lb/ft. A 5 speed manual is available for the petrol along with a 6 speed automatic option while the diesel comes with a 6 speed manual or the all new twin clutch auto system. 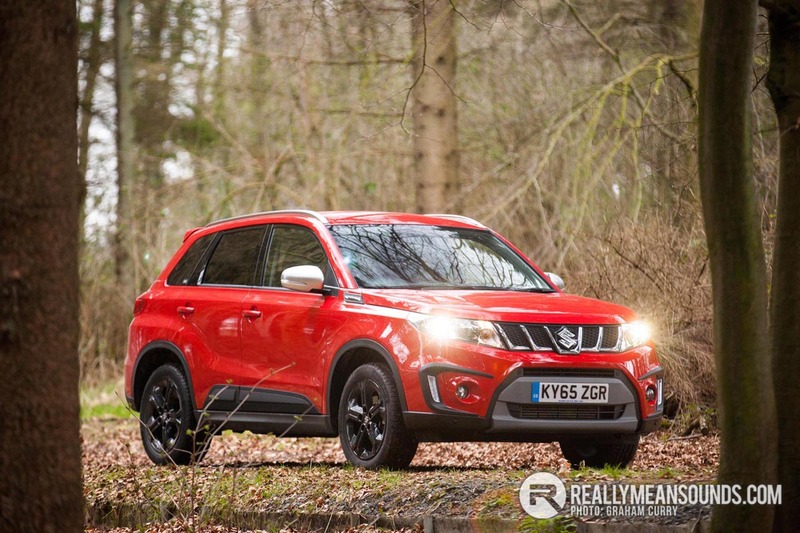 This all new Vitara S we reviewed is a little different however and is equipped with a 1400cc boosterjet engine which in simple terms is a 140bhp turbocharged petrol engine punching out 162lb/ft of torque and on the model tested was mated to the six speed manual gearbox with the six speed auto ‘box being available. As standard on the Vitara S is Susuki’s all wheel drive system, keeping it in touch with the off road ability of the old models. The new Vitara’s ALLGRIP system uses a feedback function to send more torque to the rear wheels if it detects wheel spin at the front. The new feed forward function gives the system the additional ability to predict front wheel spin risks from the road surface condition, accelerator pedal position, and steering angle and then send more torque to the rear wheels before wheel spin occurs. The system’s four driver-selectable modes are as follows: Auto | Sport | Snow | Lock. 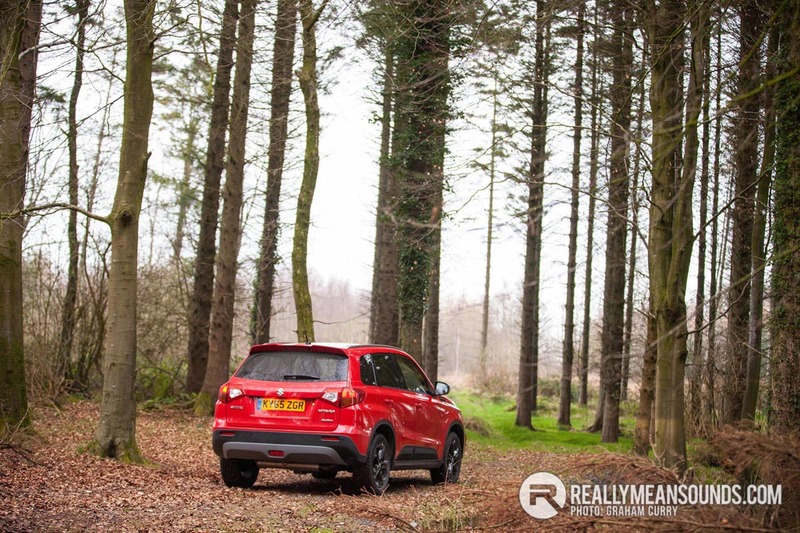 Having done a few hundred miles in the Vitara S I have to admit that I was very impressed with the drivability and quietness of the engine never mind its punchy performance whilst still returning just shy of 50mpg over a week’s mixed driving. 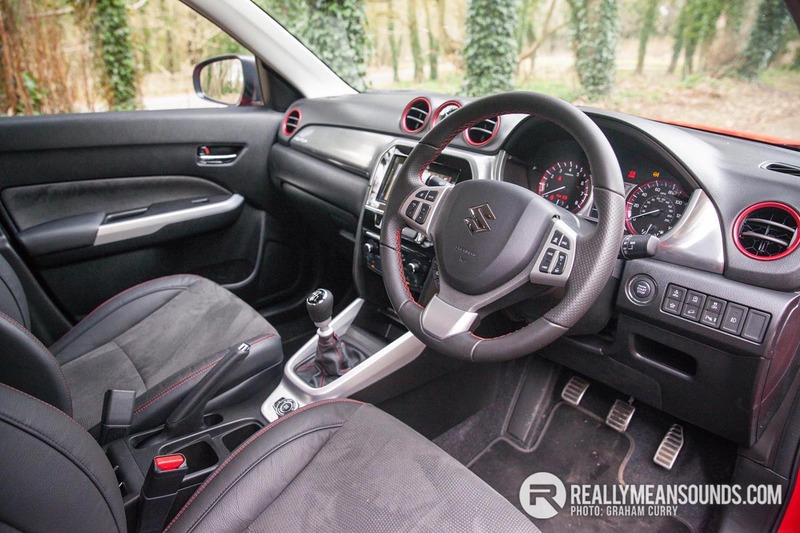 The Vitara S features red rings within the cabin around the air vents, beautiful red stitching around the half leather/alcantara interior, steering wheel and gear stick as well as an analogue clock in the centre of the dash. Outside the S model features satin silver door mirrors as well as black front fog lamp bezels, black wheels and a colour coded rear spoiler. Exterior colour choices are limited to just four, Black pearl metallic, bright red (as reviewed), Grey Metallic and White Pearl Metallic. 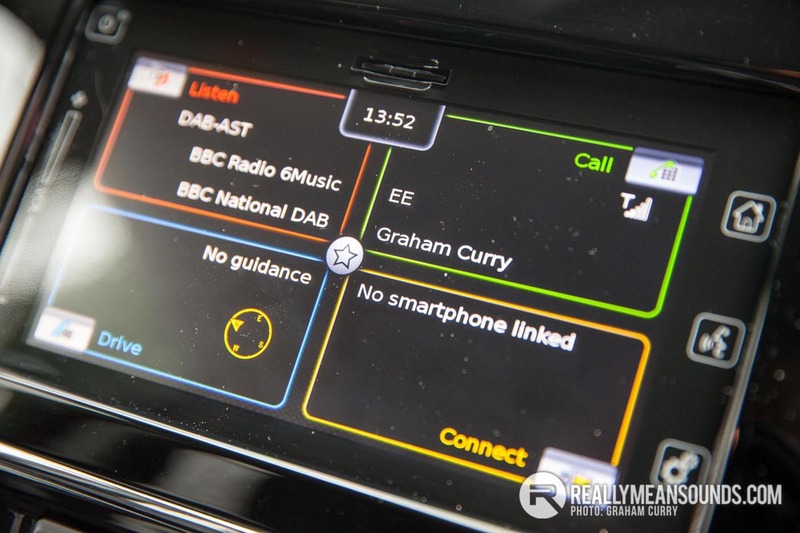 On top of this there is a huge array of options available to stylise, protect, personalise and tech up your Vitara S.
Inside there is ample room and an abundance of technology with a touch screen media system in the dash providing Navigation, Bluetooth, DAB Radio, USB connectivity, Smart Phone connectivity, Aux input and speech activation as well as electric mirrors and windows with rear privacy glass and reversing camera (which was crisp and booted in seconds) in the model we test drove which comes in at around £22,000. The seats were relatively comfortable for most driving however when on a nice back road, some more support would have been welcomed, there was room for two huge take away coffee’s in cubby holes down by the handbrake and a boot (with removable floor to deepen the load space) that swallowed all my photographic equipment with ease (few cars can manage this if truth be told so a thumbs up for luggage space). If I was to pick any hate for want of a word it would be the cheap looking and feeling dash plastics and the centre dash column that my knee battered off a lot but this was maybe due to my driving position. All in all, a huge thumbs up from me on this latest incarnation of Suzuki’s most successful model. Probably the same engines from ten years ago. Big improvement, I think they look good. Still wouldn't buy one though ^:o). I think that looks pretty good, like it in red too. They've done away with the older Diesel engine then? Mother in law had a couple of the older models and i found them a bit of a pig to drive. Heavy clunky gear changes and at 70mph with only 5 greats it was almost crying for 6th. Not to mention really uncomfortable on any sort of a journey. From your review (which is great) this new model would seem a pretty new car all round. The previous one was a proper off road capable brute. This has moved with the times and all new engines etc. This 1400cc turbo petrol was quite enjoyable actually for what it is. WHY ARE YOU SHOUTING IN THE THREAD TITLE! :P Not a bad looking jeep, but the new Tucson and Sportage have it licked. | WHY ARE YOU SHOUTING IN THE THREAD TITLE! :P Not a bad looking jeep, but the new Tucson and Sportage have it licked.